Wed., Oct. 24, 2018, 11 a.m.
Johnny English, the secret agent of last resort, need not mean the movie of last resort. 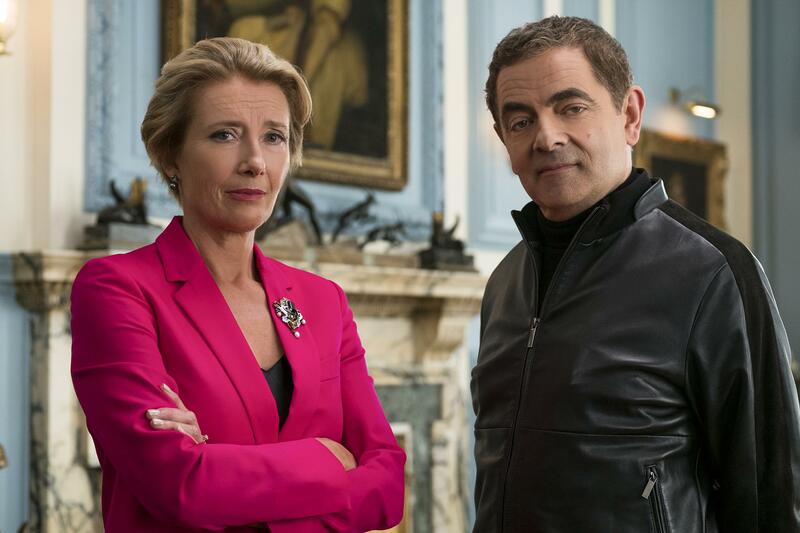 In “Johnny English Strikes Again,” the charming third chapter in the surprisingly durable spy-spoof franchise about an inept secret agent, retired MI7 operative Johnny English (Rowan Atkinson), is called back into service – but only after a cyberattack exposes the identities of every other agent in the field. When we first catch up with English, he has been teaching espionage to British schoolchildren, leading his proteges in a martini toast to an imaginary femme fatale. (“You’re looking particularly beautiful tonight,” the class repeats in unison.) After the prime minister (Emma Thompson) brings English back into the fold, he immediately reverts to his signature bungling, in a hilarious episode involving an exploding fountain pen. You read that right: It’s hilarious. It’s hard to explain why the old exploding-pen gag would still be funny, in 2018. But Atkinson – utilizing the rubbery face and bulging, expressive eyes that served him so well on the silly British sitcom “Mr. Bean” – delivers a brand of charming buffoonery that is a balm for these troubled times. The title character reunites with his sidekick from the original 2003 film: his hapless partner and straight man Bough (Ben Miller), who tries to wrangle something approaching competence out of his blundering colleague. As the agents set off to track down the bad guy (Jake Lacy), a hacker who has targeted British infrastructure, they forswear smartphones, choosing to use purely analog – hence untraceable – devices instead. The movie takes this curious fear of technology even further, with the film’s Elon Musklike villain persuading the prime minister to store sensitive government data on his own private server. But this cautionary 21st-century theme inevitably takes a back seat to more timeless – and shameless – slapstick, with director David Kerr (who primarily works on British TV) allowing Atkinson plenty of room to flex his comic muscle. When an insomniac English mistakes an energy pill for a sleep aid, he does what any other sleepless secret agent might do: He goes out dancing, managing to evade the murderous plotting of an enemy agent (Olga Kurylenko, of “Quantum of Solace”). Does it matter that the joke repeats an episode from the 2011 film “Johnny English Reborn” (arguably, the best of the series)? Hardly. Atkinson’s energy is that infectious. Like “Mission: Impossible – Fallout,” in which a 56-year-old Tom Cruise famously did his own stunts, “Johnny English Strikes Again” showcases yet another gracefully aging star of a storied spy franchise. Here, however, Atkinson may even outdo Cruise, with the comedian hurling his 63-year-old body into the service of comedy. With this latest installment in what has turned out to be a surprisingly consistent series, Johnny English’s old-fashioned pratfalls make for an irreverent raspberry in the face of evil. Published: Oct. 24, 2018, 11 a.m.